Helen Hickman and Martin Hooper wrote during 2010 with some additional details of the Gaydon family, one branch of which were watchmakers at 102 High Street. In 2011 Janet McNamara provided three newspaper cuttings which provide details about Edwin Gaydon's death and funeral, also an advert published shortly before he died in 1913. In May 2012 Martin Hooper provided some further updates which are incorporated below. I read with interest your piece about No.102. I wanted to supplement and amend some of the information in your article regarding the Gaydons, since they are my ancestors and I have been researching them, although I am by no means an expert. Some of the conclusions you draw may be slightly inaccurate particularly the question as to whether the brothers' claim that the business was "Established as a Watch Makers’ over 300 Years’ ". Edwin and Henry were descended from Alexander Gaydon (1795) and Susannah Sommerville. I have been told that there were 26 clock and watchmakers in the Gaydon family in and around Barnstaple over several generations, so the likelihood that the family, if not the specific business in Brentford, had been in the clock and watchmaking business for 300 years, was probably true. Another connection of which you may not be aware is that the Gaydon partner of Birch and Gaydon Ltd, Goldsmiths, Silversmiths, etc. of Fenchurch St, London was Edwin and Henry's great nephew, Henry Martin Gaydon. He was distinguished as a Master of the Worshipful Company of Clockmakers in 1925. He is related to Edwin and Henry through his grandfather Henry Gaydon (1798), who was Alexander's brother. Henry Martin Gaydon's father John Gaydon (1821) was also a clockmaker and was responsible for constructing many of the church clocks in North Devon. My interest is primarily Henry Martin Gaydon who was my great grandmother's (Helen Gaydon) brother. One of my distant Australian cousins who is descended from Alexander Gaydon (1837), also Henry Gaydon's (1798) son (a definite shortage of names in this family! ), is writing a book about the descendants of Henry Gaydon, so if you have additional information to share or would like to be updated on any pertinent information we find out, please let me know. 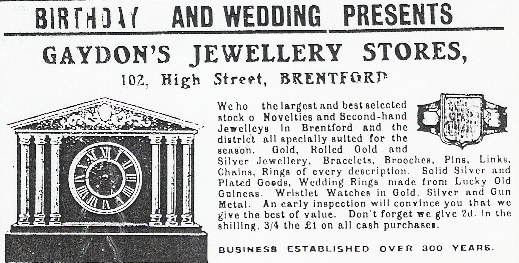 I have read with interest your material on Brentford High Street and in particular that relating to Edwin Gaydon, jeweller and clockmaker at 102 High Street. I am researching and writing on the 19th century Gaydon Clockmakers (in excess of 25 clock & watchmakers). Members of this Gaydon family were variously Clockmakers to the Queen, Watchmakers to the British Admiralty and Master of the Worshipful Company of Clockmakers. Regarding Established as a Watch Makers’ over 300 Years: we think it more likely Edwin was claiming 300 years based on the business not the family. The claim may still be questionable: Henry Martin Gaydon’s father, John Gaydon b 1820, was not a clockmaker. He was initially a butcher and then the relieving officer for the Barnstaple Union. The John Gaydon b 1821, a well known clockmaker of 99 High St Barnstaple, was the elder brother of Henry b 1825 and Edwin b 1830 who had Brentford associations. These two Johns (born 1820 and 1821) were first cousins. Alexander b 1837 (referred to in Helen's account) was a brother of John b 1820. This all means that Henry Martin Gaydon of Birch and Gaydon was a first cousin once removed to Henry & Edwin Gaydon. Edwin Gaydon was one of 5 brothers who became clockmakers. They served their apprenticeships in Barnstaple in the 1840s. One stayed on in Barnstaple and the other four moved to the London, Middlesex, Surrey area. The one in Barnstaple supplied quite a few Church clock and over 150 railway clocks in the later part of the 19th century. My book on the Gaydon Clockmakers was published in 2011. My research (and the contributions from many others) has generated some interesting insights into these 2 brothers, Henry and Edwin Gaydon. Their chapter is 22 pages. Their partnerships lasted from about mid 1850s to late 1880s. Edwin stayed on at Brentford as you know (and Richmond and Hounslow) and Henry & sons were at Walthamstow. With the death of Edwin, the business adopted the name 'E & M Gaydon'. The M being daughter Maude. The business was closed in 1927 as the property was sold. There was an auction of stock on Friday 27 May 1927. This advertisement also claimed the business was established in 1656. Not just 300 years ago but an actual year date. There are direct descendents of Edwin around (but no longer Gaydons)... One had a jewellery shop in Lee-on-Solent and one in Wellington New Zealand up until the late 20th century. A small group of us is focused now on the wider history of the Gaydon family. Download Front and back covers including image a Barnstaple Gaydon clock (PDF). In 1879, the firm of H & E Gaydon, Brentford, submitted the successful tender for the supply of a tower clock to the Central London District School at Hanwell, Middlesex, now the Borough of Ealing, London. Download more details, including images of the turret clock as a Word document. 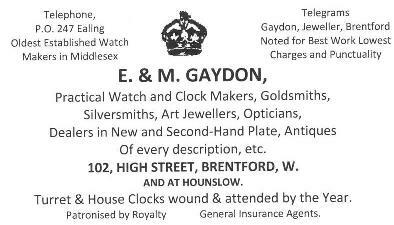 With the death of Edwin in 1913, his businesses at 102 High St Brentford and 46 High St Hounslow, continued to operate and adopted the business name of E & M Gaydon. The first of these advertisements below carried a crown and claimed to be patronised by Royalty. It seems highly likely that Maude and Elsie Gaydon continued to operate this business until its demise in 1927. It was Maude and Elsie who were living and working with Edwin at 102 High Street, Brentford at the time of the 1901 census and 1911 census. They were named also as the executors of Edwin’s will. An advertisement concerning E & M Gaydon appeared in a Brentford regional newspaper in 1927. The business of Messrs E & M Gaydon, Jewellers & Silversmiths, High St, Brentford, was closing. Surplus stock was being sold by Auction on the premises on Friday 20th May 1927. The advertisement told of the last days of Gaydons at 102 High Street Brentford after more than 70 years. A transcription of that advertisement from an old newspaper clipping is given below. The clipping does not carry a year date or newspaper name. From the date Friday 20 May, the year can be calculated and is 1927. It also claimed the business was established in 1656, almost 300 years earlier. Frank Matthews in conjunction with Herbert Platt F.A.L.P.A. has received instructions to sell the surplus stock by Auction on the premises as above on FRIDAY, MAY 20th 1927 and following days at 11a.m. and 3 and 5 p.m. the whole of the surplus stock at the above Premises consisting of High-class DIAMOND and other gem-set Jewellery. Ladies’ and gentlemen’s rings, set with Diamonds, Sapphires, Rubies, Emeralds, Pearls, etc,. Diamond and other Gem-set Pendants, Brooches, and Ear-rings, Gold Bracelets, Bangles, Guards, Necklets, etc. Gentlemen’s Single-stone Diamond Rings, Signet Rings, &15 and 19ct. Gold Single and Double Alberts, Seals, Pendants, and Medals, Scarf Pins, Studs, Links, etc. A Splendid Stock of Solid Silver and Electro-Plate Comprising Tea and Coffee Services, Afternoon Tea Sets, Tea Tray Salvers, Cake Baskets, Entre Dishes, Breakfast Dishes, Teapots, Biscuit Barrels, Jam Dishes, Toast Racks, Day Frames, Cruets, Butter Dishes, Cases of Fish and Dessert Knives and Forks, Fish and Meat Carvers, Table and Dessert Knives, Forks and Spoons, Tea Spoons, etc. Owing to Short Notice No Catalogues. Neither Maude nor Elsie married. Elsie, eldest child of Ernest Edwin Gaydon, was born 1885 and died in 1931. Maude, youngest child of Edwin Gaydon, was born in 1867 and she died in 1942. Text Box: What makes a clock a clock? Thanks to Janet McNamara who provided three cuttings from 1913. The articles are text only and have been OCR'ed, I have retained the format as far as I can. and jeweller, of 102 High-street. Brentford. peacefully died early on Thursday morning. FUNERAL OF MR. E. GAYDON.